Ever wish you had your very own Pokemon by your side when you're mining for Red Stone? Then Pixelmon is the Minecraft mod for you. Pixelmon isn't new, and in fact has wowed aspiring Pokemon trainers for years, but it's far too cool to ignore. 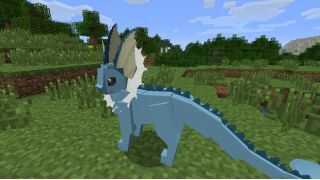 The mod recreates the magic of the original Pokemon games in glorious block form, allowing its players to catch their favorite Pokemon, which replace the normal animals of Minecraft. You can then command them to perform menial tasks and pit them against other trainers' Pokemon in a fight to the faint. Even better, all of these activities are done with each Pokemon's iconic abilities, like "Cut" to chop down trees and "Rock Smash" to, well, you know. There have been some impressive feats in the realm of Minecraft mods, from the reimagining of Minecraft creator Notch's $70 million mansion to a complete, 1:1 scale recreation of the country of Denmark. But the idea of catching and training all of our favorite pocket monsters in this loveably blocky world brings on a nostalgia too powerful to ignore.